The Russian military has claimed that the Syrian air defences, whose most modern weapon is a three-decades-old Russian-supplied anti-aircraft system, shot down 71 of 103 missiles fired by the US and its allies, the UK and France, a claim denied by the Pentagon. As further details began to emerge about the sites targeted by the US-led strikes, Col Gen Sergei Rudskoi of the Russian military said the strikes had not caused any casualties and that Syrian military facilities suffered only minor damage. It was not possible to verify the claims. The most up-to-date system that Moscow has supplied to the Syrian regime is the short range Pantsir S-1, which has an anti-missile capability. Russia said its advisers had spent the last 18 months completely rebuilding the Syrian air defence system, and said the high number of intercepted rockets spoke to “the high effectiveness of the weaponry in Syria and the excellent training of Syrian servicemen prepared by our specialists”. Although Russia suggested that Syrian forces had been responsible for manning their own air defences, Russian advisers have a long history of operating systems in such situations. Video footage that emerged in the aftermath of the strikes appeared to show air defence missiles being launched. The Pantsir – which has reportedly been used in the past to shoot down several drones and missiles in Syria – is far more modern than Syria’s other anti-aircraft systems that make up the backbone of the country’s air defences, some of which which first came into service in the Soviet Union in the late 1950s and 60s. Syria claimed to have intercepted suspected Israeli missiles fired on a base earlier this month, while an Israeli jet was brought down in February. Moscow said Syria used S-125, S-200, Buk and Kvadrat systems to repel the attack. The US said three targets Russian officials named six airbases as specific targets of Saturday’s attacks, including al-Dumayr military airport, an airbase near the city of Homs, and the Shayrat airbase that was targeted in 2017. Rudskoi said Syria had Soviet-made defence systems that Moscow has “completely overhauled”, including S-200 systems and Buk missiles. He said Russian air defences in Syria – including state of the art S-400 coastal missile batteries located at the Russian naval base at Tartus and elsewhere – monitored the strike but did not engage any of the missiles. Rudskoi said the Syrian military used Soviet-made air defence systems with high efficiency, shooting down all of the missiles aimed at four key Syrian airbases. The most significant Russian response for the region, however, is likely to be the announcement that Moscow will consider supplying Syria with S-300 missiles in response to the attack. Vladimir Putin said in 2013 after talks with EU leaders that Moscow had refrained from supplying the powerful S-300 air defence systems to Assad’s government. 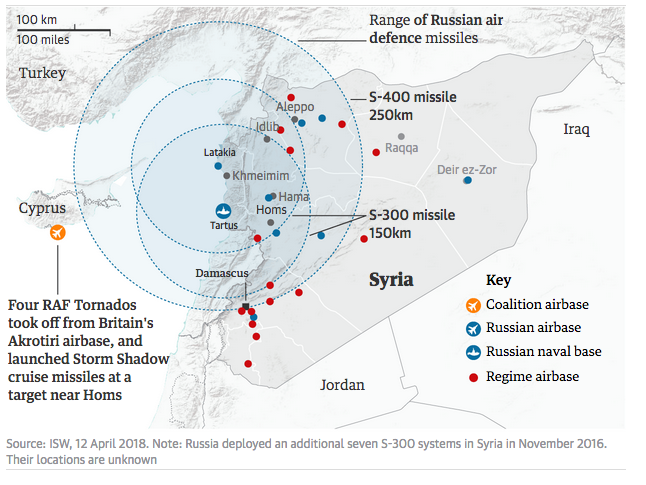 While the supply of S-300s to Syria is unlikely to trouble the US military, their widespread deployment would make it much more hazardous for Israeli jets to target Syria as they have done with relative impunity until recently. “Considering what has happened, we consider it possible to reassess this question and not just as far as concerns Syria, but other countries too,” Rudskoi said on supplying the missile system. The latest raids have underlined how, despite the huge humanitarian cost of the war in Syria, the country has become a proving ground for some of the world’s most advanced weapons systems, deployed both by the US and Russia. According to reports in the immediate aftermath of the attack, the strikes involved the first combat use of the JASSM advanced missile, reportedly fired from US B1-B Lancer heavy bombers. The stealthy cruise missiles, which have a range of 230 miles (370km), can carry a 450kg warhead and use infrared sensors to guide themselves towards their targets. Each B1 can carry four. The weapon, like others used in Saturday’s strikes, can be delivered from outside the Syrian and Russian air defences meaning that the aircraft and ships involved would not be exposed. The use of the JASSM – which first came into use nine years ago – would fit with Donald Trump’s tweet this week warning Russia the US would respond with a “new” and “smart” missile. Trump and Putin have been engaged in recent months in something of a rhetorical arms race over weapons systems and their capabilities, with Putin boasting of new hypersonic nuclear missiles and high-speed submarines before the recent presidential election. Russia this year deployed its most advanced fighter jet to Syria, the stealth-capable Su-57.